Take your home theater to the next level with the PDSB10A. Watching movies and sports at home with surround sound can be an incredible experience — but without a subwoofer, you're missing the low-end frequencies that make the movie or sporting event feel real. This 100 W active sub features a 10' long throw driver and class AB amplifier for powerful, realistic bass. Features a stereo line input and stereo line out over RCA, so you can use this sub as a crossover for your system as well. The elegant wood finish looks great and compliments your speakers well. 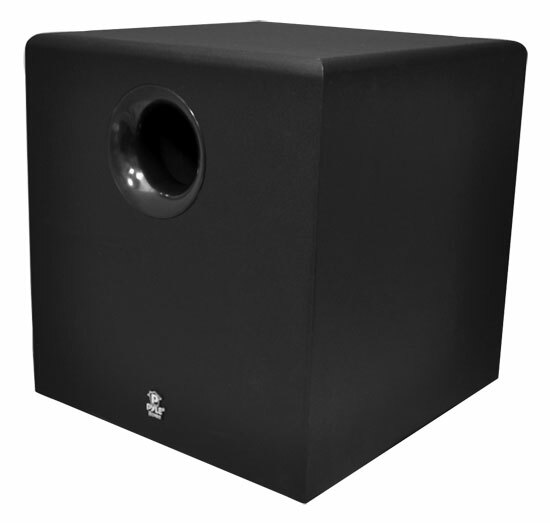 Whether you're upgrading from a smaller subwoofer or adding one to your system, the PDSB10A is perfect for you. I recently purchased this product for use with an Onkyo receiver. It was a little confusing as it has inputs for left and right channels. Because my receiver has already split out just the bass, I wasn't certain how I should connect it and the instructions don't take this into account. I finally just connected to the left audio input and it seems to work fine. It would also be nice if it had a mode where it would effectively "sleep" when it was not receiving a signal, but for the price, how many features can I expect. All in all it seems to be designed assuming a 2.1 system, but seems to work well with my 7.1 system. I just bought this speaker because it says that you can play your MP3 or laptop through it by plugging in directly. I just hooked up speakers to the output to speakers and all I hear is the bass. Why doesnt it send sound through the other speakers?